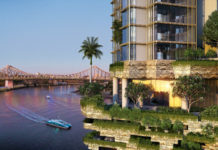 Forise Holding’s new skyscraper at 3 Trickett St, Surfers Paradise has undergone a new design as well as a new name – Spirit. The tower has increased in height slightly, laying claim as Queensland’s tallest tower and sporting a new blue wave-like facade design. Rising to 298m, the skyscraper will now be slightly taller than the Eureka Tower in Melbourne. Residential density has dropped from 693 to 479 bedrooms as the building will now have a smaller floor plate from 49 to 38 per cent of the site area. 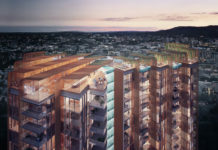 Designed by DBI Design, the skyscraper will boast Australia’s highest rooftop pool of any man made structure. 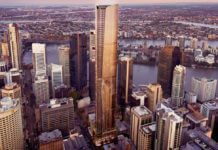 The highest liveable floor will be around 292m, eclipsing the 78-storey Q1 where the occupied height is 235m. The company expects the revised DA to gain approval by September. Early excavation works have already started on the building site, which Forise Holdings bought for about $65m in 2015. Forise expects to start main foundation work by the end of September. According to the Hong Kong-based developer, construction will commence on the project without any pre-sales. The original development submission can be viewed here. Another project…another rejection of meaningful landscape design.